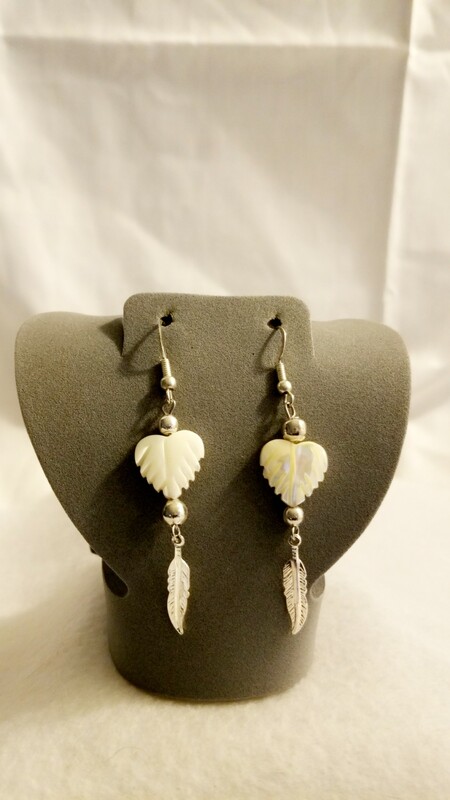 These dainty Mother of Pearl Leaf Earrings are delightful and charming. These dainty Mother of Pearl Leaf Earrings are delightfully charming, making for a subtle addition to your outfit. These dainty Mother of Pearl Leaf Earrings are delightfully charming, making for a subtle addition to your outfit. 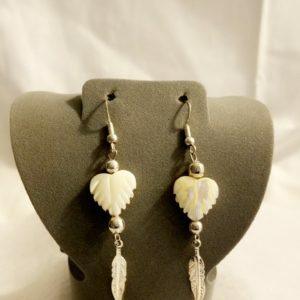 Made from dainty Mother of Pearl carved leaves with silver colored accent feathers these earrings are just splendid. Mother of Pearl or Nacre - is an organic-inorganic composite material produced by some mollusks as an inner shell layer; it is also what makes up the outer coating of pearls. It is strong, resilient, and iridescent. Mother of Pearl is predisposed to hold the capabilities to heal the infections of the physical torso, moreover, cures the irritation caused. A holder of the energies of water and water waves, it is a fossil gem that roots out the negativity along with the off-putting thoughts from the torso for attaining a balanced life. The vitality of the stone to helps to transmute unconstructive emotions into the enthusiastic one for maintaining equilibrium within the surroundings. The energy it resonates too renders harmless vibes. Nacre holds the potency of nature in a true sense due to its creation as well as its extraction. 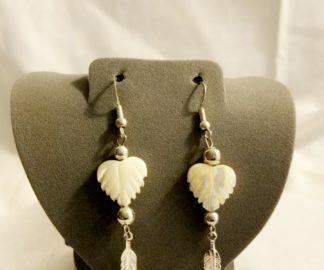 If you would like to know more about the gemstones, rings, and items that are used in making handmade items like this, Mother of Pearl Leaf Earrings; please take a look at the Material Description Page. Please remember that since this is a handcrafted item there can be some small tool marks (scuffs) on the piece, please remember this when purchasing.